Take a trip on a public train or a walk down a road in our city centres and you will easily find pamphlets marketing remedies for anything, from enlarging penises to bringing back lost lovers. Even more seriously, the city lamp poles are plastered in posters offering cheap pregnancy termination services. Poor people stand on street corners for hours offering pamphlets and directions to the closest ‘doctor’. All illegal, all dangerous, but almost all operating with impunity. But what Mbeki and Tshabalala-Msimang had done successfully, was to sow seeds of doubt. Many, many people living with HIV, desperate for a remedy not only to control the virus, but to exorcise it from their battered bodies, turned to the quacks, who promised to do so. What was criminal was that these ‘doctors’ were operating with the tacit support of the leaders who had the power to close them down. They included the likes of German multi-vitamin peddler Matthias Rath; KwaZulu-Natal truck driver and seller of a concoction called uBhejane (the recipe of which he said was revealed to him in a dream by his ancestors) Zeblon Gwala and the likes of Tine van der Maas a barefoot Dutch nurse who pushed lemon, garlic, beetroot and olive oil concoctions at the behest of the health minister, or Belgian eccentric Kim Cools who continues to claim that he had injected himself with the HI virus but remains negative due to his remedies (see previous Spotlight). 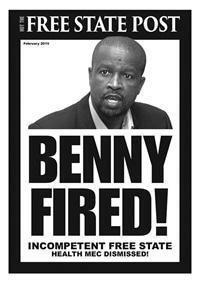 Dr Benny Malakoane is a medical doctor and was until recently Health MEC in the Free State. Over a three-and-a-half year period he oversaw the collapse of the public health-care system in the province, and turned the state machinery on elderly community health workers who were asking inconvenient questions, while facing multiple charges of fraud and corruption (these cases are still ongoing due to continued delays).It now appears that, much like Manana and Nkonyeni, Malakoane enabled a quack to operate with impunity in a state hospital, using unsuspecting state patients as guinea pigs in an illegal stem cell trial. In fact, this operation had been signed and sealed in a three-year contract which was due to further impoverish the Free State health system and enrich the shareholders of ReGenesis Health with millions of rands. Not on our watch. The ball is in your court Premier Magashule. Previous PostPrevious Opinion: Will we get the NSP right this time?